No one would expect to find important clues for understanding rural vitality by comparing these two countries, when people in rural Canada and Japan lived in quite different worlds until the mid-1940s. Before the mid-40s rural Canada was already organized to adopt industrialization. On the other hand, Japanese rural people had inherited a culture and economy established since the beginning of the 18th century. Therefore the Japanese rural economic, resource ownership and social structures of the 1940s were basically unprepared for industrialization. After the Japanese defeat in 1945, rural people and policy leaders were awakened and noticed how far they were behind the Western World. They started to pursue rural industrialization to catch up. The changes for rural people of both countries over the last 50 years provide insight into the dynamics behind the vitality of these rural economies. Two rural towns in Canada and Japan are compared to explore how they have changed since 1950 as an aspect of rural dynamics. The structure of dynamics in rural places, where farming, forest and fishery have dominated their economies seems changeless over long periods of time. However the nature of change in the twenty-first century and the pace of this change varied significantly over time. The first section presents our understanding of rural dynamics. After discussing the twentieth-century rural changes of Canada and Japan in section two, we use two case studies of Tweed, Canada and Iitate, Japan to compare changes since 1950. NRE researchers from both countries accomplished intensive household surveys in these two NRE research sites in 2001-2002 (see Appendix 1). The third section looks at challenges for the future. We close by interpreting a model for rural dynamics through the experiences in the two case studies. The way tension arises within a broader concept of rural dynamics leads to understanding the prospect for rural vitality. Rural dynamics is about change. People get older, get different jobs, live in different places, meet new friends, and lose old friends. Technology changes the way we work, where we work, and what we do at work. Technology also changes how and with whom we communicate. Places also change. Businesses open and close, services come and go, and people move in, out, and through. At the same time, many aspects of rural life remain the same. People maintain an attachment to place, help their neighbours, and enjoy the small-town feel. These changes are what rural dynamics is all about. What people want and do not want varies within a locality and across localities. This diversity among people and across places creates tension. Diversity is the fundamental ingredient of dynamics. Tension arises between the old and the new, between fast and slow changes, and between change and stability. Change and tension affect people themselves. This effect on people is not mere change but knowledge creation through people’s maturity. Rural dynamics, therefore, lies in the interaction of change, tension and knowledge creation (Nonaka, 1995). Tweed is located in the province of Ontario, Canada, while Iitate-mura is located in Fukushima Prefecture, Japan (see Chapter 1, Figure 1). The rural lifestyle of the Village of Tweed in the 1950s gave way to an urban lifestyle as rural dynamics shifted from a focus on the railway to the highway. This shift benefited Tweed, which had the advantage of being located halfway along the shortest route between Toronto and Ottawa. The highway linking Tweed to the urban centre of Belleville was paved, straightened, and shortened in the 50s. The Federal Government announced that the Trans-Canada highway would follow Highway 7, which passes just to the north of Tweed. Plans were also underway to build a superhighway (Highway 401) from Toronto to Montreal, which passes 32km south of Tweed. Many rural town manufacturers were doing well in 1950. As reported in the local paper, Tweed industrial owners, including steel works, foundry, veneer, food processing, and cheese manufacturing, maintained that they were comparatively free of lay-offs and business was busy. Provincial government jobs provided stable employment for many local families. Iitate-mura is located in highlands 400-800m above sea level. It is about 60 km east from the prefecture capital city of Fukushima-shi and about 45 km west from a main city of Kashima-shi along the Pacific Ocean. It took two to three hours to reach each city by bus in 1950. Iitate-mura consists of one local commerce area and another 19 rural hamlets (shuraku). In Iitate-mura, the rural lifestyle of the early 1950s was not much different from that of the 1850s. The dominant economic activities were agriculture, horse-rearing and charcoal production using production methods from the early 19th century. In the early 1950s there was little in the way of modern equipment, 6 trucks, a few radios and electricity sufficient for lights in Iitate. A small company mined iron and copper ore in a mountain area with about 130 employees in 1950. The mine was absolutely isolated from the local economy and people’s life, and closed in 1951. Rural Canada and rural Japan experienced similar circumstances since the 1950s. Income levels, living standards, sense of values, technology, influences of national and global economies, and politics are comparable. The rural areas of both countries have also had to deal with an aging population, out-migration of youth, decline of primary industry, and increased global exposure. 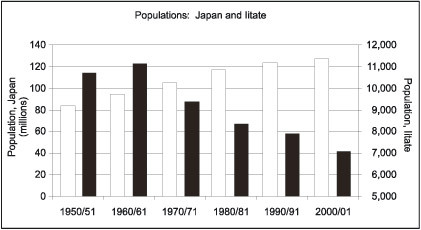 In contrast to the national populations of Canada and Japan, the rural populations of Canada and Japan have decreased since mid-century. Figures 1 and 2 show the national populations and the populations of Tweed and Iitate, respectively. 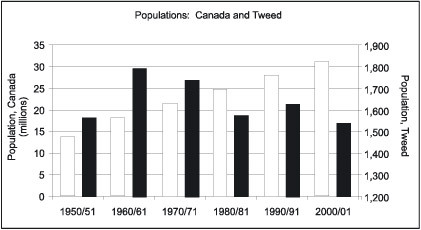 In 1961 Tweed’s population peaked at 1,791. Today, its population is about the same as in 1950. The population of Iitate peaked in 1955 at 11,403. In 2000, Iitate had 38% fewer residents. The population peaked in both Tweed and Iitate at about the same time. As Table 1 shows, Iitate was much younger than Tweed in 1950/51, but much older in 2000/01. The average number of persons per household in Iitate and Tweed decreased, but the number in Iitate remains absolutely higher than in Tweed. Even today, young families in Iitate are accustomed to living with their parents. Note 1. Figures of Canada are in 1951 and 2001, and of Japan are in 1950 and 2000. 2. Number of households* and average number of persons per household** of Japan are based on the ordinary household and its total population. Tweed attained modern living standards before Iitate. As the rural infrastructure (roads, electricity, telephone) of Ontario improved so did rural household amenities. By 1951, washing machines, televisions, radios, and passenger cars were becoming standard household items in Tweed (see Table 2). In Iitate, households were supplied with electricity for lights in 1950, but had no other modern amenities. Drinking water was supplied by hand pump and until the 1960s firewood was the main energy source. Rural Japan modernized between 1960 and 1980. Today, rural residents of both countries experience a similar standard of living. (percentage of households possessing each item), 1951 and early 2000s. Note 1. Canada’s figures are based on data for Hastings County, which includes the Village of Tweed. There were very few motor vehicles in Iitate in 1950 (see Table 3). People transported farm products by horse back or by horse carriage. Today almost all households have one or more vehicles. Note. The number for Iitate includes automobiles owned by corporations. The economic base of Tweed has changed since 1950. Many rural town manufacturers were eliminated in the 1950s and moved to the cities, and Tweed’s economic base shifted to tourism. In 1950, the Tweed Chamber of Commerce launched a campaign for attracting new business and boosting tourist traffic throughout the area. The Chamber was concerned that Tweed merchants were losing business to other centres. Although Tweed lacked sufficient tourist facilities to serve an expected increase in tourist traffic, the village established itself as a service centre for a wide area. Many changes took place on the agricultural side. As egg prices started falling, the Federal Department of Agriculture established a minimum floor price. The cheese manufacturing industry, once a mainstay in the area, started its decline. A Toronto-based company purchased the Hastings cheese company. Telephone service was greatly improved by replacing wire with cable. Electricity supply was improved. Water mains and sanitary services were upgraded. Police services were on call 24 hours a day, and post office facilities were modernized. In August 1950, a new municipal building opened. A significant increase in the tertiary sector partially compensated for the decline of the manufacturing base and the loss of government jobs (see Table 4). Service sector jobs generally were lower paid jobs. The output share of the primary sector was only 1.1% in 1951 because Tweed was and still is a business center in the region. The main source of income in Iitate in 1950 was agriculture, which is not surprising as 86% of the labour force was in farming. The mass exodus from farms was just beginning in Japan during the 1950s with 48% percent of the labour force still on farms in 1950. Most of the main products produced on farms, except rice, in 1950 had disappeared by 2000. Barley, pulses, silk, firewood, charcoal and horse-rearing in each farm household were replaced by tobacco, flower farming, and/or large-scale livestock operations fed by manufactured feed stuffs. In the 1970s the municipal government of Iitate tried to attract factories by offering property tax reductions and subsidies. The aim was to employ local residents in manufacturing jobs. In 2001, 25 manufacturing establishments employed 502 workers. The two largest were electric companies, linked by contracts to leading multinationals in Japan. As Iitate is in a remote area and far from main highways and railways, it does not have a special attraction for industries except cheap labour. Though cheap labour is quite common to other rural areas in Japan, the Municipality of Iitate attracted these two companies from the Tokyo area through local resident networks and by offering good tax treatment and other incentives. Note 1. n/a means ‘Data are not available’. 2. ‘Agriculture and other resource-based industries’ in Iitate consists of agriculture, forestry, fishery and mining; agriculture was dominant with 85.9% in 1950 and 31.4% in 2000. 3. Iitate’s ‘Manu, Const and P sectors’ means manufacturing, construction and government sectors (municipal and prefecture employees including school teachers). People have diversified their occupations and enjoy the modern lifestyle in Iitate. Agriculture remains important not only because 31.4% of the labour force is engaged in agriculture but also because the share of farm households is 65% of the total households in 2000. Many people engage in farming activities on a part-time basis, not as their main income source. Agricultural activities remain one way people maintain some traditional sense of values and behaviour while benefiting from their modern lifestyle. This pluriactivity helps keep unemployment low in rural Japan and reduces underemployment. Although both municipalities of Iitate and Tweed employed a similar number of people in 1950, the number of people employed by the Iitate municipality today far exceeds that of Tweed (see Table 5). The number of people employed by the Village of Tweed increased from 2.6 persons/1000 populations in 1951 to 9.0 in 1996. This includes a reeve (mayor), deputy reeve, and salaried staff; it excludes casual labour. In Iitate, the number of public servants increased from 2.6 persons/1000 population in 1950 to 33.7 in 2000. This includes the mayor and deputy mayors. In the 1950s the main municipal functions in Tweed were road maintenance and tax collection and in Iitate were family registration for school, administration of compulsory military service and taxation. Table 5. Elected officials and municipal employees, Tweed and Iitate, 1950 and 2000. Note 1. On payroll, full- and part-time, excluding the Reeve/Mayor and Deputy Reeve/Mayor. 2. There were two Mayors and Deputy Mayors in 1950 before the Municipality of Iitate was amalgamated from two municipalities in 1960. Iitate, like most Japanese rural municipalities, realized rural modernization quickly after 1950. The municipal government expanded its functions with major central government financing to include economic development, increasing its workforce by thirteen times between 1950 and 2000. Unlike Tweed and most Canadian rural municipalities, local government continues to be responsible for a wide range of development services for agriculture, manufacturing, commerce, road and bridge construction, education, public health, and people’s welfare except fire protection and waste management services that belong to the association of neighbouring municipalities. Teachers of primary, junior high school and high school work for the Prefecture. The restructuring of Ontario Government services in the mid-1990s, including significant cutbacks in staff levels, hurt Tweed. The Ministry of Natural Resources office closed, affecting nearly 50 families, the hydro office reduced staff from 50 to 30, and a project to build a seniors’ care facility was cancelled at the last minute gaining approval only in 2007. These job losses were not good. Local retailers suffered and are still recovering. Retail ownership along Tweed’s main street has experienced a high turnover. A number of discount stores have come and gone within the past five years. Although early improvements of roads and highways benefited Tweed, continued improvements have taken traffic away from Tweed. Tweed residents do more of their shopping in Belleville, which has a full range of mega-retail outlets, stores, services, and amenities. Retail development has also expanded to the north, taking away a consumer base that once shopped in Tweed. In 1999 the Village of Tweed, Hungerford Township, and the Township of Elzevir and Grimsthorpe amalgamated, becoming the Municipality of Tweed. While most residents approved of the amalgamation, the municipal election of November 2003 illustrated a new dynamic. Tweed, like many other rural towns, wants to increase its economic base in order to support local employment and keep their young people from moving away. Since 1996, business activities along the main street have remained fairly constant, though there have always been changes among individual businesses. Thomco Pallet remains as the most visible and single largest manufacturer in town. Tweed relies upon tourism and is looking to build upon this resource by partnering with neighbouring towns for mutual benefit. Many attempts to maintain a vibrant business association have failed since 1950. In 2003, a new local Chamber of Commerce was formed. In collaboration with neighbouring business associations, the Tweed Chamber created a new tourist district called Comfort Country that includes Tweed and three surrounding municipalities. The aim is to increase the profile of the area to tourists by presenting a comprehensive destination package. Another positive development is that Tweed’s main street has become the first area of the village to get access to high speed Internet. Challenges are centered on two issues: job losses and aging infrastructure. The loss of people and wages directly affects the whole village. Substantial capital financing is required to replace and upgrade aging roads and bridges. Presently, larger trucks are unable to use municipal roads because of weight restrictions. Infrastructure issues will be a significant financial issue in the near future. Meanwhile, the cultural infrastructure of Tweed is growing. The Tweed and Area Heritage Centre significantly expanded their facilities since 2000. After a very successful fundraising campaign, a new addition was incorporated into the existing facilities. This quadrupled the Centre’s floor space, which is now home to an archive, art gallery, and an extensive display of local heritage items. The historic dance pavilion (built in 1929) was renovated over a three-year period by a number of groups under the sponsorship of the Kiwanis Club. The work was completed in 2003. Both are strong symbols of Tweed’s past and present strengths. The greatest challenge in the 1990s is a shrinking economy. The granite mining and processing industry that developed in the 1970s in Iitate declined sharply after the revaluation of the Japanese Yen in 1985. The number of mining operations declined from 9 in 1980 to 1 in 2003. More enterprises are moving operations overseas. For example, the Tsukiden Kogyo Ltd in Iitate decreased from 575 employees in 1997 to 400 in 2002. Meanwhile, it has opened a factory in the Philippines. In contrast to the mining sector, the agricultural sector is relatively stable. The average farm size was still 1.7ha in 2000. In 1985 an agricultural cooperative and the chamber of commerce organized a network for Iitate-beef marketing. It had about 1,500 urban customers and opened a meat shop in Iitate in 1995 to supply locally produced beef to Iitate residents. Local farmers also opened five farmers’ markets in Iitate and one in the capital city, Fukushima-shi. The Municipality of Iitate also invested in the beef industry. It financed a feedlot with a capacity of 500 head in 1989 and it buys calves born in Iitate. In 1993, the Municipality opened a steak restaurant to serve Iitate-beef. An inn was opened in 1994 for local residents and visitors. New areas of economic activity are developing in Iitate. In 1992, a local entrepreneur obtained equipment for roasting coffee beans and opened a café in Iitate with her husband. Today their café attracts many customers from outside Iitate and their roasted beans are distributed nation-wide through a door-to-door delivery system. Municipalities in Japan are obliged to prepare a Municipal Development Plan every 10 years. Iitate’s early plans focused on agriculture and greater industrialization supported by the government. The consequent modernization resulted in raising people’s living standards and brought working standards closer to national averages but at the cost of lost quality of life. People began to realize that modernization was not the only goal. Iitate has tried to adopt alternative measures to revitalize the economy beyond the industrialization of the mid-1990s. The fourth plan in 1994 paid attention to ‘quality of life’ as a concept of rural vitality, and people strengthened this concept in the fifth plan in 2004 in spite of a large income gap between Iitate and urban areas. Of the 89 municipalities in Fukushima Prefecture, the per capita income of Iitate is 2,254 thousand yen, the lowest in the Prefecture according to estimates by the Prefecture in 2000. The fifth plan emphasizes increasing local economic multipliers by distributing or circulating local products and resources within the local economy rather than developing markets in metropolitan areas. The Plan encourages networks among local people and local corporations and cooperatives. Like Tweed, Iitate also experienced pressure for municipal reorganization. Unlike Tweed, the Congress eventually rejected the amalgamation proposal, raising major challenges for continuing the municipal initiatives for economic development. The national government had promoted municipal amalgamation since 2000 by cutting back revenue transfers while giving new subsidies as incentives to amalgamate (see Chapter 8). Looking beyond Tweed and Iitate, rural Canada and Japan as a whole have limited prospects for significant growth. Japan in particular faces many issues beyond rural depopulation such as high debts at national and local government levels, budget tightening, and economic and trade issues associated with the technical transition from industry to information and bio-engineering technologies. Each of these factors presents both positive and negative concerns people must address. At the same time, growing diversity in values compounds decision making on these issues. Unlike the post-war period of modernization, there is no clear future for all to agree upon. According to Miyamoto (1998) and Omori et al. (2004), a healthy rural community is one that invests in itself. By putting time and energy into matters of local significance, a healthy rural community builds capacity in what is close and familiar, in things that are increasingly important in a complex world. Investing in one’s own community means intensifying flows of people, goods and information within a community, as was done by the initiatives undertaken by the local residents of Iitate after the 1990s. It means reorganizing local assets and people for supporting local economies, local food systems, local knowledge systems, and local people’s life. These investments will contribute to reduce transaction costs for access by urban people who want to survive with the rural. A model of rural dynamics consists of a rural economy/society defined by some kind of boundary, an internal interaction process, cross-boundary interactions, outcomes, and feedback from outcomes to the society. Rural societies consist of rural communities, players and assets. The interaction process is one that mixes and changes the character of communities, players, assets, technologies, knowledge and information through the players’ activities inside and across the boundaries, as they are defined by each player. The consequent dynamics produces rural outcomes, including revitalization or devitalization. Some kind of energy is needed for stirring economic and social structures. Rural dynamics can never occur without energy. In our way of thinking, energies originate in people’s desires or interests to change or not to change. Energy is generated fundamentally from the tension arising out of this difficult decision-making process, and by the tension that is provoked by changes in technology, knowledge creation, exchanges of people and information, and disasters. In the twentieth century industrialization, urbanization and globalization were the main energy sources for rural societies, with the policies of the central and provincial or prefecture governments playing significant roles as external influences. Not surprisingly, in the process of internal interactions among these factors and players, tensions may be amplified or decreased. When tensions from the outside of a rural society are more influential than those within the society, the outside gradually extracts rural assets, labour force and rural outcomes. Moreover, when the feedback from the outcomes to the society is weakened or is not harnessed constructively, the rural society is usually devitalized. Therefore, a rural society needs rising internal energy within it or transformative external energy in addition to the internal one. During the 1950s Tweed had enough internal energy to modernize its society and economy because Tweed was a gateway to the northern areas and a junction point for the railways. The change of regional development policy from the railway to the highway networks since the 1960s reduced the internal energy of Tweed people and economic activities. Moreover the urbanization of Belleville as the regional centre, the growth of big industries and restructuring of the Ontario Government gradually extracted activities from the small-scale industries and commercial services in Tweed and its surrounding areas. Iitate people’s life and economic activities were very traditional before 1945; its modernization and industrialization started in the 1950s, just after the external energy provided by land reform. These changes were due not only to this external energy but to the internal energy from within Iitate. Iitate’s people really wanted to modernize their lives and agriculture as their principal economic activity. The central government and Iitate municipal government, as the agent of the central government, played a significant role in this modernization. Until the 1980s Iitate people realized their goals up to a certain point through the use of protectionist policies. However, the globalization after the mid-1980s and downsizing of the central government affected the dynamics of Iitate’s economy and people’s lives. Industrialization and modernization generated internal energy for driving the rural dynamics in both Tweed and Iitate. Since the 1970s in Tweed and the 1990s in Iitate when people realized an affluent society, these forces have ceased to provide sustaining amounts of energy. Heritage and a ‘back to basics’ lifestyle seem to provide weak internal substitutes for this energy. Institutional tensions created by central/provincial/prefectural government policies, such as the recent amalgamation policy for municipalities, no doubt will continue to play some role in the dynamics of both rural places. Both peoples seem to expect to revitalize their communities through asserting their influence in rural decisions. The people in Iitate and Tweed are at a fateful juncture in their respective histories. The question for the future of Tweed and Iitate is how their internally driven dynamics and decision-making will serve as a vitalizing force in an ongoing stream of new external energies. Miyamoto, K. & Koichi E., et al. (1998). Chiiki Keiei to Naihatsuteki Hatten: Noson to Toshi no Kyosei wo Motomete [Region Management and Endogenous Development: For coexistence of rural and urban]. Tokyo: Nobunkyo. Nonaka, I., & Takeuchi, H. (1995). The knowledge creating company. New York: Oxford University Press. Omori, W., Odagiri, T., et al. (2004). Jiritsu to kyodo niyoru machizukuri dokuhon [Guidebook for rural development through self-reliance and mutual help], Gyosei, Tokyo.